This essay is not easy reading. In fact, I found it both depressing and disillusioning (not that I had many illusions, to start with) and deeply angering. It is a classic example of the cultural Marxism prevalent in the academic world, and one of the reasons I did not choose to go on and obtain a PhD in Medieval History, as had been my original intention, since I saw the same trends developing in medieval studies, all the way back in the mid-’90s. For a number of years, it was assumed that public education was swimming along, efficiently educating children of all ages. More recently, the products coming out of public schools have caused a troubling concern to leap into the minds of adults: are schools dumbing down the content they teach to students? I would also add, society is teaching students that they ought to be able to get anything they want without much effort, intellectual or otherwise! Mike Rowe: Lending money to kids who can’t pay it back to educate them for jobs that don’t exist anymore is a bad idea. “I don’t regret college, I believe it was the right choice for me, but I do regret not being more thoughtful about the degree I chose. I love history but if I had it to do over again, I would double major in something a little more employable. Indeed. I have said for years that we as a society make a mistake when we try to sell “college for all.” For any reason, but particularly as a ticket out of poverty! First and foremost, not everyone has the intellectual gifts and temperament for college. Actually getting them through it – which we must, if we are claiming that anyone can go to college, and everyone should – means that a) academic standards are being “dumbed down,” and b) colleges themselves are refashioning themselves into glorified vocational institutes, which is unfair both to them, and to genuine vocational institutes, which have for a long time gotten a great deal less credit and support than they deserve. On a related note, it fosters the greed and expansionism (both part of fallen human nature) to which colleges and universities – no less than any other large human institutions – are prey, leading them to seek to recruit more and more students (whether they are what was once called “college material” or not), thus exacerbating the problems. Speaking of problems, when more and more students are (by hook or by crook) graduating, diploma in hand, we have a growing issue of degree inflation: in which an Associate’s, or even a Bachelor’s, degree is needed to perform jobs which once could be filled by a qualified high school graduate, a Masters to fill what were formerly Baccalaureate positions, and a Doctorate to fill what used to be Masters-level positions. From the standpoint of economic success, the reason a college or university degree used to be a pathway out of poverty is precisely because it was RARE. It was indicative of a person with an unusually high degree of intellect, drive / determination, or simple sticktoitiveness, either singly or in combination. That is obviously not the case when a degree is simply another ticket to be punched, on one’s way (hopefully, but less certainly all the time) up the ladder. It was also viewed by those tasked with hiring as a major plus because a college or university graduate could reasonably be considered to be a person who had both a certain broadness of perspective, and who had received training in broadening and fostering his or her critical thinking skills. With colleges and universities morphing into vocational training schools, the classic liberal arts breadth of perspective is increasingly becoming a thing of the past; while even a brief survey of the level of political – or if there even was such a thing any more, philosophical – discourse in this county by folks who theoretically are the beneficiaries of higher education leads to the inescapable conclusion that critical thinking can no longer be counted upon as one of the fruits of such education. But the root problem is this: if everyone has a thing, it is no longer special. Would anybody care about having a Porsche, if everybody had a Porsche? Businesses aren’t going to pay someone more for a college degree if everyone has a college degree! So the more people who seek one as a means of getting hired, or paid more, the less likelihood there is that any particular degree-holder is going to be hired, or given a raise. The most they will do is refuse to consider anyone who does not hold a degree, transforming what – as I mentioned above – used to be a selling point, into a necessity. It is difficult for me to see how this is an improvement in the situation! On a personal level, I agree with you, Olivia: I am the holder of a B.A. in medieval studies, and a Masters in theology. While I do not (usually) regret either degree, I also have to be honest enough to admit that cool as they are, neither has proven particularly salable! They have not brought me the level of financial stability – forget about “success,” whatever that means – that the salesmen for universal college education would like people to believe. If I could do it over again, I, too, would have chosen my major(s) with more care, taken a second and more salable major, or at the very least gotten my teaching certificate when I was in college the first time. Or perhaps better yet, learned a trade, to fall back on. Degree inflation was already a “thing” when I graduated in 1991, and the intervening almost 30 years have increased the problem exponentially! That doesn’t mean that those degrees weren’t worthwhile in other respects: they were, and are. I am very glad, from a personal and philosophical standpoint, that I got the education I did. But as money-makers? Not so much. Thank God I didn’t go on for Ph.D. study, and come out with that level of debt, and not much more chance of finding employment! If I had dictatorial powers, I would make colleges and universities smaller, not larger; shrink, rather than increase, their enrollment; and return them to what they used to be: places for those who wished to grapple with the larger and deeper existential questions of life – for the pursuit of Truth, Beauty, and Goodness. At the same time, I would strengthen opportunities for vocational / technical learning, which is badly needed, and which can be done more efficiently and economically in other contexts than a college or university environment. Higher education and vocational training are not the same thing, and it’s time we stopped pretending that they are. Author The Anglophilic AnglicanPosted on August 17, 2018 August 18, 2018 Categories Essays & Reflections, UncategorizedTags Academia and Higher Education, Culture and Society, Economics, Education, Work Vocation and Employment3 Comments on Mike Rowe: Lending money to kids who can’t pay it back to educate them for jobs that don’t exist anymore is a bad idea. 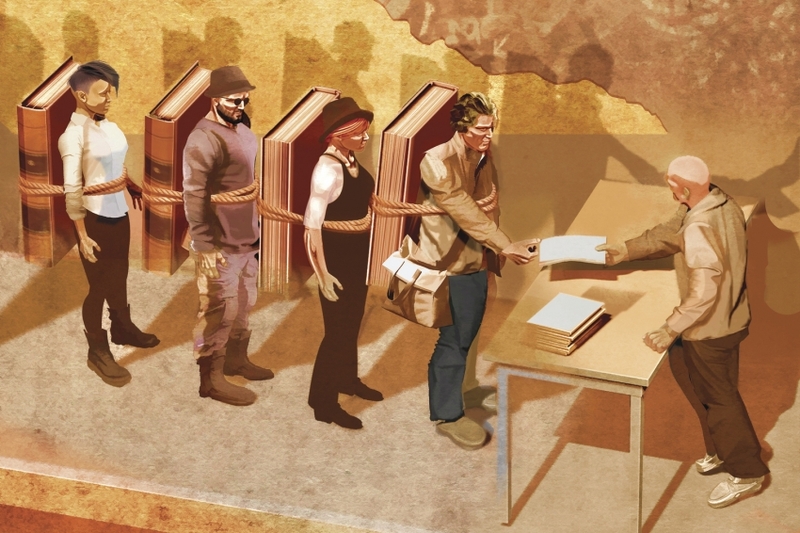 How the humanities survive on exploitation. As much as I love writing, and as much as I respect those who write well and on worthwhile subjects, when I was dreaming of becoming a professor, I did not want to write, primarily and as a major end of my professorship: I wanted to teach. I wanted to share such knowledge as I had, by God’s grace, managed to acquire with young (mostly) people who were hungry for it, in some cases whether they knew it or not. The old saw, “publish or perish,” stuck in my craw, as I knew that would take time and energy away from actually teaching – actually professing, the theoretical job of a professor (a.k.a. “teacher of the love of wisdom,” philosophiae doctor, the meaning of Ph.D.). Clearly, the situation has not improved in the decades since the mid-1990s, when I pretty much laid that dream to rest. “Adjuncts now do most university teaching and grading at a fraction of the price, so that the ladder faculty have the time and resources to write.” That pretty much says it all. Don’t get me wrong, I (of all people) am not knocking writing, per se! But when it takes so much time away from actual teaching that the only way to maintain the educational function of an institution of higher learning is to hire underpaid, easily-fired adjuncts to do the “dirty work” of actually teaching – because the “ladder faculty” are so busy writing they don’t have time to actually interact with students – something is badly wrong. The problem is not limited to higher education, of course; non-profits, and even county- and state-funded agencies, rely on low-paid or non-paid interns, volunteers, or seasonals to do the majority of their work. I have written before of the bitter irony that volunteers are considered to be “worth” $24.14/hour (as of 2016), based on their value to the organization, according to Independent Sector – while those same organizations pay their part-times and seasonals (which describes just about everyone except the director) $9 or $11 an hour. The situation clearly is not much improved if you’ve spent years of your life and many thousands of dollars getting a doctorate. That is appalling. That is indeed – or should be – a source of great shame. Surely we can do better. Surely we must! Why are college students turning away from studying history as preparation for a future as citizens and workers? Of course, the author feels that he has to defend history (and the humanities generally) as being excellent preparation for “real-world” careers such as business and technology – which they are, without question – rather than pointing out, except obliquely, their necessity for constructive thought and good citizenship in the polis, the public square, especially in a representative democratic-republican society which absolutely requires an informed citizenry. Nonetheless, this is an encouraging article. While currently an almost minuscule proportion of degrees awarded – as this article points out – I am seeing the beginnings of a stir of push-back, as more and more people begin to realize, or promote, the idea that the humanities do, in fact, have value, both in themselves and for the way in which they teach people to think critically and constructively. I will never forget one of my favorite college professors noting that “the most important thing a college education can give you is a good crap detector.” He was and is correct! With respect to history in particular, however: it does indeed teach critical thinking, and is valuable for that reason; but it also teaches vital content. As the inscription literally graven in stone above the entrance to the National Archives puts it, “What is past, is prologue.” Learning our history provides us with the tools to make sense of the present, and to shape a coherent and constructive course into the future. That we seem all-too-often incapable of doing either is an indictment of our willingness to abandon historical knowledge! And of course, failure to learn our history cuts us off from our roots. As I have commented previously, a society is very like a great tree, in that if it is separated from its roots, it is far more likely to wither than to blossom and bring forth fruits and new growth. Indeed, one can say that that withering is absolutely inevitable – the question being not “if,” but only how quickly! There is evidence that the pendulum is beginning to swing back in a more conservative / traditional direction, with respect to socio-political matters. Let us hope and pray that it swings back in the academy, as well. As an academically-trained, as well as avocational, medievalist (my B.A. is in medieval studies, and my Master of Theological Studies was focused primarily on early and medieval Christianity), “so much for the Dark Ages” is a pretty good condensation of my own conclusions! The “Dark Ages” were not nearly as “dark” as most people think; there was a good deal of scholarship, and quite a lot of creative thought, going on in them, and while some elements of the knowledge of late Hellenistic antiquity were lost to the West until the Renaissance, thanks to both monasteries and cathedral schools, much survived. What I had not fully realized was the extent to which that knowledge was available outside of the cloister and the University. I should have! I was aware of private tutors, as well as the vast number of “clerks in minor orders” who were not, properly speaking, clergy, but who were the recipients of academic training in the aforementioned monastic and cathedral schools, and later the Universities, and passed that knowledge on – for a fee! – outside the walls. What I hadn’t realized, but should have, was that then as now, education began young: for how could older youth be beneficiaries of knowledge without the seeds of learning being sown in their younger years? Latin is not learned overnight, nor is philosophy, nor yet the trivium and quadrivium. The existence of parish grammar schools is not something I had thought much about, one way or the other, but it is certainly not surprising. Most interesting, though. Most interesting indeed! History isn’t a ‘useless’ major. It teaches critical thinking, something America needs plenty more of. Unfortunately, history – and other humanities majors – are not being “sold” to students / prospective students (or anyone else, for that matter) because they do not appear to have an immediate, direct “practical” application. The extreme push to channel everyone into “higher education” – regardless of temperament or aptitude – has exacerbated the problem, while cheapening (as I have discussed many times previously) the value of the degree received. Unfortunately, I fear we are turning out a passel of graduates who may well be prepared to work in the IT, health-care, or other “STEM” fields, but have little-to-no breadth or depth of knowledge in the areas – history, literature, philosophy – that are necessary to function effectively (learning from history in order to make sense of the present and intelligently plan for the future) in the polis: the public square, as citizens of a functioning representative republic. Trade schools would be the more appropriate venue for those who want skills alone, but a working republic needs a core of critical thinkers, and persons well-grounded in the wisdom and experience of the past. Instead, we are turning out, as others have commented on many occasions and in many fora, a herd of sheep, easily swayed by demagoguery: whether you consider the demagogue in question to be Trump or (for instance) Hogg is immaterial. Of course, adding to the problem is the fact that, in the words of one commentator, “the history curriculum at most schools [teaches] indoctrination instead of critical thinking.” I was fortunate to have received my undergraduate training at a time when, despite inroads from the late ’60s, ’70s, and early ’80s, the humanities were still being taught with a strong sense of passing on worthwhile traditions (and, yes, cautionary lessons) and teaching critical thinking. That is less true, now… to put it mildly! Author The Anglophilic AnglicanPosted on April 4, 2018 Categories Essays & Reflections, UncategorizedTags Academia and Higher Education, Cultural Heritage, Culture and Society, Education, History, Western CivilizationLeave a comment on History isn’t a ‘useless’ major. It teaches critical thinking, something America needs plenty more of.